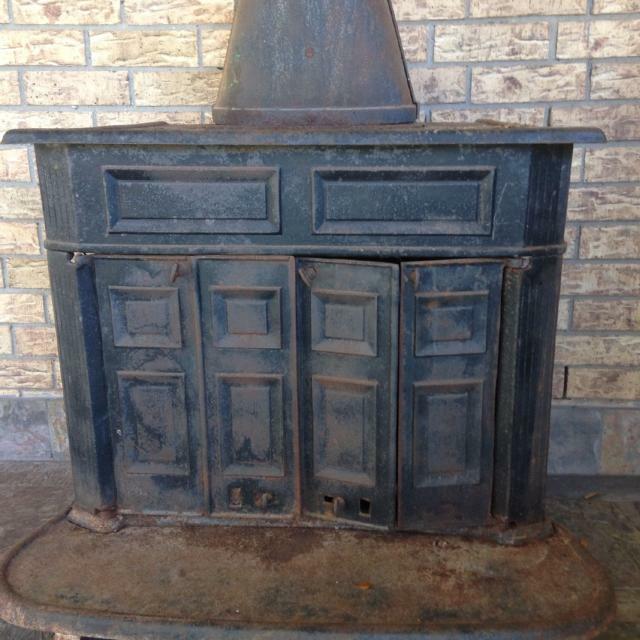 The Franklin wood stove is a free standing, cast iron fireplace insert created in 1741 by Benjamin Franklin. Also referred to as a Pennsylvania fireplace or a circulating stove, the design used two distinctive features.....a hollow baffle and an inverted siphon to harness more of the fires heat when compared to an ordinary open fireplace. The inverted siphon is basically a U shaped flue that draws the hot burning gasses of the fire up and over the hollow baffle positioned in the back of the stove. The heated air inside the baffle is then expelled into the room through two holes near the top of the stove. The free standing stove is completely open in the front and if placed in the center of a room it can radiate heat from all sides. However, the stoves original design had one major flaw....it created poor draft due to the inverted siphon. As the smoke entered the flue, it cooled off to much before it reached the chimney reducing the draft. In order for the draft to function properly the fire had to burn continuously to keep the flue hot enough to create a strong draft. Do this flaw, the stove sold poorly. Franklin never patented his stove which allowed many others to improve on its design and ultimately make it more efficient and effective. The greatest improvement came in 1780 by David Rittenhouse which used an L shaped flue to vent smoke out through a chimney which made the stove become much more popular. Compared to todays more modern wood stoves, the Franklin wood stove is inferior when comparing firewood usage and most importantly, safety. Back in the 1970's Montgomery Wards sold a ton of these stoves. They typically had 3 legs and a set of bi fold doors on the front. They're designed to be burned with the doors open and they burned really hot, which is nice for heat output, but very unsafe. The doors on the front are basically used to seal the unit when it's not in use making it more of a fireplace than a true wood stove by todays standards. Franklin stoves are extremely inefficient and burn a lot of firewood. Plus they smoke profusely during use and the fires inside are hard to control often resulting in over firing (burning too hot) and creating a fire hazard in your home. Now, many homeowners have replaced these stoves with more modern, efficient and safe wood stoves. In fact, most homeowners and professionals will agree a Franklin is better suited as an ornamental planter in your garden than a functioning stove. If you're looking to purchase a wood burning stove for your home I would not recommend installing a Franklin. Even through you can still find them online or maybe from a friend, the stoves are just too dangerous and not efficient enough to install in your home. Look for a more modern wood burning stove that will burn far less firewood, smoke less and be safer for you to use.